Bid on this cup for Japan! Thanks to GlobalGiving, our charity for Handmade For Japan, you’ll be able to triple the impact your money has when you win this cup of mine in an eBay auction slated to end on Monday, March 11th at 9pm est. If you donate before midnight, March 11th, GlobalGiving will match your donation 200%, so $25 becomes $75! And even if you don’t participate in the auction, please consider donating, even if it’s $10. Every little bit helps! March 11th marks the two year anniversary of the Great East Japan Earthquake and Tsunami that devastated the region north of Tokyo and claimed upwards of 19,000 lives. While there has been some progress with infrastructure in the region, there’s still much to be done to rebuild livelihoods and normalcy, especially for children in Tohoku and those in Fukushima. The Japanese government has received much deserved criticism for its slowness to help evacuees and its continued lack of transparency regarding issues of radiation in Fukushima. GlobalGiving is funding almost two dozen Japanese organizations dedicated to making the lives of Tohoku residents better. Some of these charities include leadership training for local youth, support for orphanages, broadening radiation sensor networks, and connecting aspiring entrepreneurs with local business leaders to stimulate economic recovery at a local level. 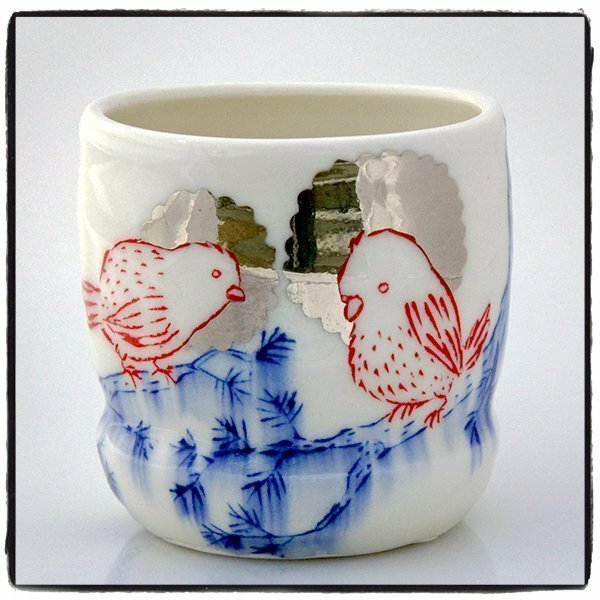 This porcelain love bird cup with silver luster will go up for auction on eBay on Sunday, March 10th at 9pm and end a day later at 9m est on Monday, March 11th. The bidding will start at its retail value of $160 and 100% of the proceeds will be donated to GlobalGiving who will match it 200%. In 2011, I co-founded Handmade For Japan with my friends, Kathryn and Ai, who went on as partners in their new online venture called Studio KotoKoto, which focuses on Japanese and American craft. I’m pleased to announce that the winning bid was $668, so with the double matching grant, $2004 was made for GlobalGiving’s Japan Fund. Thanks everyone for spreading the word and bidding!